In the year 1889 there was revolution in Paris. No shots were fired, no buildings torched, no palaces looted. But on the Champ de Mars and the Esplanades des Invalides, the past and the future fought a world war of ideas. Iron battled stone, Javanese ritual music defied the siege of German orchestration, electricity triumphed over gas. It was a year to celebrate a revolution's centennial, a time to consolidate one hundred years of industry, art and social ideals that flowed from the great events of 1789. In the early 1880s, it appeared that Paris might not again host an international exposition. The previous one had lost money. In spite of the constant stream of boasting in the French journals reporting on the 1878 fair, there was no getting around the stark fact that the 1867 exposition universelle – the culminating festival of the now-despised Second Empire – had produced a profit of almost three million francs, while eleven years later the Republic's world's fair lost more than thirty million francs. There was a bright side to these comparisons, however. Less than seven million people had attended the 1867 fair. Over sixteen million had come to the 1878 exposition. Clearly, here was statistical proof that The People had responded more warmly to the Republic. So, despite the pundits' predictions of financial catastrophe, the leaders of the government of France decided that the birth of the Republic should be celebrated and vindicated in 1889, the centennial year of the French Revolution. Therefore, intoned Monsieur le President Jules Grévy, be it decreed on this eighth day of November, 1884, that there shall be held, from May sixth until November sixth, 1889, the fourth exposition universelle. Antonin Proust, Minister of Instruction and Fine Arts, was appointed President of the Exposition. A distinguished group of experienced men were placed in charge of the financing, building, and arranging of the Exposition Tricolorée – so-named for the colors of the French flag adopted during the Revolution – Paris would once again play host to the world. The whole financial basis of the exposition was devised so that the affair would show a profit. The government, which had borne the entire cost of the three previous Paris expositions, paid for less than a third of the costs of mounting this fair. The city of Paris defrayed some of the expenses; but more than half the money was raised by an investors' guaranty association. This parsimonious approach to expenditures did help the exposition to realize a profit of eight million francs. But, as we shall see, the government would have done even better if the exposition committee had struck a shrewder bargain with Monsieur Eiffel. Even with the experienced Antonin Proust at the helm, the project had to withstand several assaults from the forces opposed to the government's plans. To begin with, there were those who saw no good at all in hosting such a show. These critics remembered not only the financial loss of 1878, but the shortage of hotel space, the high cost of food, the traffic jams, and other inconveniences caused by the huge crowds of fairgoers. Paris was discovering by experience that hosting an international exposition entailed a number of costs, risks, and inconveniences for the permanent residents. Moreover, even among supporters of the exposition, there was fear that the plethora of major shows in 1888 – the Exposicion Universal de Barcelona; the Grand Concours Internationale des Sciences et de l'Industrie in Brussels; the International Exhibition in Glasgow, Scotland; the Centennial International Exposition held in Melbourne, Australia; and the Centennial Exposition of Cincinnati, Ohio – would diminish participation at the Parisian fair the following year. The late nineteenth century was witnessing an explosion of such expositions: full-blown international fairs, as well as lesser events devoted to patriotic celebrations, and gatherings designed to bring together the latest inventions or improvements under the rubric of a theme such as electricity, cotton, etc. Such events, though laudable in themselves, could diminish the attendance at the Parisian exposition. Some influential leaders thought that France should not risk another international exposition under any circumstances. Frédéric Le Play, chief commissioner of the 1867 exposition, relentlessly predicted that the 1889 exposition was doomed. In his own report to the Emperor Napoleon after the 1867 exposition, Le Play warned against trying to host a series of such events in which each one would be attempt to outdo its predecessor in size and splendor. Le Play argued, to Napoleon III in 1867 and to Jules Grévy in 1884, that the country would be better advised to invest in a permanent exposition site where there would be permanent facilities for changing exhibitions, provisions for restaurants and a greensward. Furthermore, he argued, such expositions should be specialized so as to draw only those visitors who were professionally interested in the theme of the exposition. Proust and his fellow commissioners listened politely, but ultimately dismissed Le Play's novel idea as impractical and too limited in its ambitions. The 1889 commission was committed precisely to what le Play was warning against: a colossal affair that would draw huge crowds from all walks of life, and from all over the world. In the long run, the old monarchist's vision was more revolutionary than that of the Republicans. Not for many decades would government officials think about designing permanent exposition spaces along the lines that Le Play first suggested in the 1880s. A more compelling challenge came from those old rivals of Paris: the other cities of France. Nice had successfully mounted a modest world's fair in 1883. International expositions had even been held in foreign colonies from Cape Town to Calcutta. Why, then, should Paris always be the focus of French international expositions? A battle of wills ensued in the French legislature. But Paris, as always, had her way. The small cities argued, lost, and were humiliated in their defeat as the exposition authorities commandeered the choicest paintings and sculptures from municipal collections, and transferred them to the retrospective gallery at the Fine Arts Pavilion in Paris. The decision to celebrate the centennial of the Republic at the exposition brought other difficulties to the exposition authorities. A number of foreign monarchs voiced their reluctance to participate in a festival that celebrated revolution. As a result, sixteen of the forty-three nations represented were there unofficially – that is, without the official sanction of the home governments. Great Britain, Italy, Russia – some of the most important powers in Europe officially ignored the exposition universelle of 1889. It was a test for the Republic: were the attractions of Paris, and the opportunities afforded by any exposition held there, strong enough to attract exhibitors and visitors from these nations? They were; and the result was that the attendance at the 1889 exposition was three times that of the combined attendance figures for the 1855 and 1867 expositions. World's fairs, and especially those staged in Paris, had become so important that no nation of any standing or pretensions could afford to be absent. The opportunities for industrialists, artists, and national governments to speak to an audience of tens of millions all at once were too rich to be ignored. There was still the question of expense, however. The 1867 exposition universelle, the only profitable Parisian exposition to date, came out 2,880,000 francs in the black. The 1855 and 1878 ventures had not fared so well. But the commissioners of the fourth exposition were convinced that, with shrewd financial management, the government of France and the city of Paris would at least suffer no great loss. And in the end, their optimism was justified. After the gates finally closed, the Exposition Tricolorée commissioners reckoned their fair's profit at 8,000,000 francs. When the exposition president, the three directors general and the numerous commissioners met, they agreed that the 1889 exposition should feature something special: a clou -- the "spike" that would give the entire fair a single signature structure, a striking symbol of French culture. The Committee decided that this spike should be a 300 meter tower – a structure far surpassing in height any edifice ever built. Was it Gustave Eiffel himself who first suggested the idea to the committee? Alfred Picard, author of the final report of the exposition commission, traced the idea back through several predecessors. In 1833, a British engineer named Trevithick proposed a 1,000-foot (305 meters) cast iron column to commemorate the Parliamentary Reform Bill in England. A similar idea, drawn up by the American engineers Clark and Reeves for the centennial Exposition in Philadelphia, likewise never went beyond the planning stages. But these were predecessors, not ancestors. It seems probable that Eiffel himself – or, more precisely, Eiffel and his collaborators – first urged the idea of a 300 meter tower as the most audacious spike for the Exposition Tricolorée. Even before the official announcement of a competition for the design of a 300-meter tower, Eiffel's company was at work on the plans. Maurice Koechlin, ÉmileNouguier, and Stephen Sauvestre, engineers and architects in Eiffel's employ, sketched out some preliminary plans for the tower, and presented them to their employer. He was pleased with what he saw, and so purchased the exclusive rights to his colleagues' plans. Thenceforth, the tower belonged to Eiffel. There was no question of the plan being carried forth by his subordinates, even though the idea in its first stages was undeniably their own. Only Eiffel has the financial resources, the professional reputation and the political leverage to carry the project to a successful completion. From the outset, Eiffel's plan encountered serious opposition and competition. When he presented his ideas for the 300 meter tower at the Exhibition of Decorative Arts in 1884, detractors and supporters took sides, and the debate began. The most serious opponent of Eiffel's scheme was the prominent architect Jules Bourdais. Bourdais was an uncompromising proponent of traditional styles and materials. Along with Davioud, Bourdais had designed the Trocadero Palace, the major legacy from the 1878 exposition universelle. What a coup it would be, dreamed Bourdais, to garner the commission for the 300 meter tower: a crowning complement to the twin towers of my Trocadero Palace across the Seine! Like Eiffel, Bourdais had bought another man's idea, modified it, and submitted it as his own. The Bourdais tower would have been built of masonry and crowned with an electrical light beacon so powerful that Parisians would have been able to read a newspaper at midnight by its light in the Bois de Boulogne – several miles away. But most important, from Bourdais' point of view, was that his tower would be festooned with classical detail-work in stone. In the ensuing debates with the supporters of Eiffel's plan, Bourdais scorned his rival's "vulgar" iron structure, asserted that his own stonework tower would cost only a fraction of what it would cost to erect the Eiffel Tower. Confronted with questions of the structural soundness of a 1000-foot stone structure, Bourdais turned evasive, and issued vague assurances that the structure would undoubtedly stand. But the doubts remained. The great medieval cathedral builders, Eiffel argued, had pushed to the limits the height to which masonry could be raised. Only iron and steel had the tensile strength to rise higher. Furthermore, Bourdais had made no provision for the foundations of his masonry tower. It would rest directly on the ground. Eiffel, who had already constructed enormous arched bridges all over Europe, knew that a structure 300 meters high would need deep foundations and a carefully calculated system of stresses transfer to carry the enormous load deep into the earth. Furthermore, given the height of the tower, the force of the wind would be a major consideration – "It is the wind that determined the basic shape of my tower," 5 said Eiffel. All of these factors were lost on Bourdais, who thought exclusively in terms of traditional beam-and-load structures, and for whom ornamentation was basic value of architecture. For him, considerations of utility were secondary. Bourdais had, in fact, not even made provision for elevators in his tower. In many respects, Bourdais's tower was a throwback to the conservative architectural thinking that had produced the Palace of Industry in 1855. 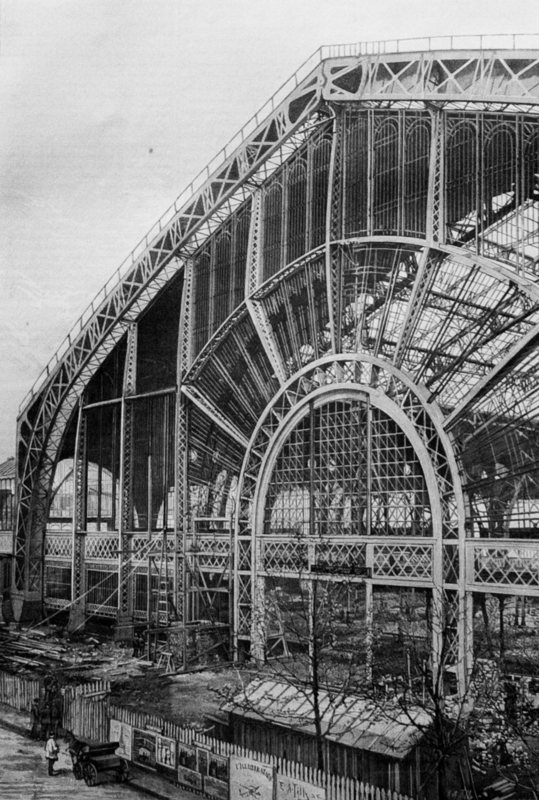 There, too, the builders had covered up an iron and glass structure with a sheathing of stone arches, partly because of their fear that the iron would not adequately hold the massive sheets of heavy glass, and partly because the stonework gave them a chance to dignify the building with the dress of classical forms and ornamentation. The Bourdais tower carried within its design the same aesthetic: unadorned iron architecture cannot be beautiful. When the examining committee met on May 12, 1886, Eiffel had already lobbied for his project and discussed it in detail with Edouard Lockroy, the new French Minister of Trade and head of the committee. All the proposals passed though this body and then a sub-committee. The 700-plus entries were narrowed down to nine, including those of Eiffel and Bourdais. On June 12, the committee announced that it had agreed unanimously that "the tower to be built for the 1889 exposition universelle must clearly have a distinctive character, and should be an original masterpiece constructed of metal. Only Eiffel's Tower satisfies these requirements fully. "6 Eiffel had won a resounding victory – a victory for him, a vindication of the aesthetics of engineering, a triumph of the present over the past. The first battle between iron and stone was over. Eiffel was awarded the contact for the tower, but he was dismayed to learn that the exposition committee would provide only 1,500,000 francs towards construction expenses – less than one-fourth the projected costs. Eiffel himself would have to finance his own revolution. With typical astuteness, Eiffel set up a series of shareholder organizations that would carry much of the costs, but leave him free of obligations if the tower proved as profitable as he hoped. Once the tower proved profitable – as it soon did – Eiffel was left in sole control of the profits from the Tower. The key to Eiffel's plan was the agreement he had signed with a special exhibition committee. This contract gave to Eiffel the entire income from the tower for twenty years. In addition, Eiffel was allowed to construct an "Eiffel Pavilion," which featured in miniature some of Eiffel’s other engineering triumphs, such as the Garabit viaduct and a tiny working model of the Panama canal – "a marvel of patience and ingenuity, a veritable Chinese labor," remarked a writer for Le Figaro.7 A 300-meter tower and a special pavilion exclusively devoted to his engineering achievements – it would be difficult to imagine a more effective advertising platform for Eiffel’s firm. At the time they were negotiating with Eiffel himself, the exposition authorities deemed it prudent to save money at the outset by having Monsieur Eiffel bear the risks involved in the construction and operation of the tower. In the long run, though, the French government discovered that it had signed away a gold mine. Eiffel retrieved almost all of his costs in the first year after the opening of the tower. Subsequent profits from the tower – restaurant concessions, elevator tickets, plus the commissions that the tower's fame brought to his company – made Gustave Eiffel a very rich man. "When it is finished, Parisians will love it,"8 prophesied Eiffel as he began work on his 300 meter tower. But as soon as the plans were published, he was greeted by a chorus of groans and rage. First came the cries of the people who lived in the neighborhood surrounding the tower. Every day people would come by and watch the construction work, gazing anxiously at the bolted beams that seemed to stretch skyward for miles. They also stared intently at the shadow that the tower cast on the ground. And the shadow moved in the wind! Surely this thing would be blown off its foundations in a strong gale! Eiffel was compelled to issue a statement in which he personally assumed full responsibility for any and all damage should his structure collapse. Honored compatriot, we come, writers, painters, sculptors, architects, passionate lovers of the beauty of Paris -- a beauty until now unspoiled -- to protest with all our might, with all our outrage, in the name of slighted French taste, in the name of threatened French art and history, against the erection, in the heart of our capital, of the useless and monstrous Eiffel Tower. The war of words continued throughout the months of the exposition, and for the remaining years of the century. Discerning visitors could see the battle between stone and iron, modernity and tradition, continued in the buildings of the exposition. In strictly quantitative terms, tradition still dominated the field. With the exception of the Eiffel Tower and Dutert's Gallery of Machines, all the exhibition buildings, French and foreign, clung to the architectural vocabulary of the past. Oriental motifs could be found here and there, adding exotic flavor to a few European pavilions and complementing the structures of the near east, far east, and South America. But the pervading spirit behind the design of all these buildings was resolutely conservative. The revolution in architecture was only just beginning. Close by, in the Palace of Liberal Arts, a series of dioramas entitled "The History of Work and Ethnography" complemented Garnier's History of Human Habitation. These three-dimensional installments showed interior scenes of domestic life in past ages rendered with the same spirit of historical fidelity. Visitors could enter into the world of the past and have a sense of the living and working space of a stone-age arrowsmith or an ancient Greek potter. In 1889, "to instruct by pleasing" was still the watchword of the designers of the exposition universelle. Garnier had taken great pains to construct the ancient living quarters with historical exactitude, to give visitors a true sense of the ambient space created by thousands of years of human builders. He was the ultimate connoisseur of tradition, an architect with the soul of an archeologist. His own History of Habitation clearly showed that the human race had made changes and improvements in living quarters since the dawn of time. But when he faced the revolution of his own period, he scorned the upstart iron, and maintained that stone was the only material worthy of the noble style in architecture. His training and temperament gave him an appreciation of the artifacts of the past, but not of the spirit that gave rise to innovation. "Quaint," "picturesque," "interesting" – Garnier's evocations of the past gathered polite praise from critics. But no matter where the visitor wandered among the buildings of the History of Habitation, the Tower loomed over them all. By November of 1889, all of Garnier's exhibit had been razed. In the center of the colonial section stood a pavilion designed by Sauvestre, the very employee of Gustave Eiffel who had sold his share of the original design for the Tower to his employer. The master constructs the 300 meter tower, the employee builds the colonial pavilion! Though Sauvestre's structure was not the lordly triumph of his employer, the colonial pavilion presided over the picturesque encampment with imperial authority. The colonials at the exposition surely recognized the inspiration for Sauvestre's pavilion: the governor's mansion at the center of the plantation, commanding a view of its subjects. Since the exhibitors from the colonies lived in the Esplanade des Invalides for the duration of the fair, life there took on something of the rhythm of existence at home. The colonial quarter began to come to life in mid-morning. At 9:00 a.m., the streets were deserted. Only the crackle of frying rice or the pungent aroma of saffron disturbed the air. By 10:00, a few of the cafés began to open their doors. Soon visitors would stray up from the Quai d'Orsay, searching for the Tunisian restaurant where they could drink thick, rich coffee from an ornate cup. At lunchtime, the restaurants and cafés were crowded with fairgoers relishing a change from the refined fare of Parisian restaurants. In the afternoon, the concerts, dances, and theatrical performances began. Crowds throng the theater in Cairo Street, where the Danse du Ventre delights and scandalizes even the scandalous Parisians.16 The audience was sparser at the Javanese theater, where the dancers seemed to be idols brought to life. In the crowd you might have seen Claude Debussy, whose Petite Suite (1888) had so enchanted Parisian audiences and given them hope that the young Frenchman might bring a truly Gallic grace to the concert halls and thereby banish the domineering Teutonic cadences of Wagner. Soon after the exposition, colonial music, transformed and naturalized by Debussy, would create a revolution of its own in European concert halls. The Javanese dancers did more than provide Debussy with a kind of cross-cultural perspective. After the close of the exposition, they stayed in Paris and performed a number of times at theaters throughout the city. Javanese dancers were "in" throughout 1889 and 1890. They represented one of the first waves of exotic chic that would become a staple of Parisian social and artistic life for the next century. So audiences that came to hear Debussy’s revolutionary Afternoon of a Faun in 1894 had been well prepared for his novel harmonies. They had been listening to the Javanese orchestras and dancers perform, and were accustomed to accept – even to wax enthusiastic about – exotic harmonies in a concert setting. During the first few months of the fair, the proprietors of the colonial pavilions were distressed that, when evening came, the crowds would desert the Esplanade des Invalides, to return home or to go back to the Champ de Mars and await the illumination of the fountains and the Eiffel Tower. How could even the belly dance compete with the splendor of the Eiffel Tower glowing against the night sky? So the colonial authorities met together, under the leadership of the Algerian and Tunisian Commissioners, and devised a plan. Every Tuesday there would be a colonial fête de nuit. All the inhabitants of the section would gather together and march in a parade through the Esplanade des Invalides. Under the benevolent eye of invited French dignitaries, the colonial procession would pass by: first, the military – Senegalese cavalry, mounted on magnificent horses; Indian foot-soldiers, Chinese sharpshooters, Algerian infantrymen. Then followed the theatrical troupes: Annamites in frightening masks, veiled women dancers from Algeria, Javanese dancers in golden robes and hieratic poses. After the Javanese came a melange of pousse-pousse cars, palanquins, Congolese villagers and natives of New Caledonia. Finally came the great Tonkin dragon rising, diving, writhing along the processional path, preceded by merrymakers waving banners, parasols, and lanterns, banging on their sonorous gongs. As if to impress the point conclusively, the French government placed the Pavilion of the Minister of War directly across from the colonial section in the Esplanade des Invalides. This massive structure, 200 meters long and 80 meters deep, was meant to impress upon the colonies that France was a nation with a long tradition of military might. The official pronouncements and the mottos on the presentation medals at the exposition extolled peace and fraternity. But the War Pavilion was a monument to the glory of combat. Memories of "The Terrible Year" were fading as the glory of colonial conquest shined brighter. Symbolically, the most striking part of the entire War Pavilion was the vestibule. Passing through the triumphal arch at the entranceway, visitors found themselves in an enormous foyer, with wide arcades leading to the left and right and a monumental, branched stairway directly ahead. There can be no question: the vestibule is a close imitation of Garnier's Opera House. M. Walvein, architect for the War Ministry, had fashioned France's military display in operatic terms. War, this building tells the visitor, is a stage – a splendid drama with a venerable history and a future made promising with technology. As visitors rode their magic carpets across the Esplanade, the moral of the tale became clear: the Republic consolidates the Revolution with military might. France extends her glory, quashes insurrection abroad with the revolutionary advances in weaponry and armed hordes of colonial soldiers fighting under French leadership. The Exposition Tricolorée proclaims the Empire of the Republic. From a vantage point of more than 100 years after the event, it seems paradoxical that the French, who took such pride in their nation's colonial enterprise, would celebrate this empire in an exposition commemorating the very Revolution that freed the French people from oppression. It is also ironic that, at the Exposition Tricolorée, the nation with which France felt the closest kinship was the United States – itself a former colony. Of course, the French did not see themselves as the oppressors of their Asian and African colonies. France, as the self-proclaimed leader of civilization, was favoring them by bringing their governments and customs under the protection and encouragement of French culture.19 After all, look at how well the United States had turned out, once they had incorporated the principles of the French Enlightenment into their Constitution! Thomas Alva Edison repeated his triumph of the 1878 exposition. His inventions had undergone significant improvement in the intervening years; and it was recognized, in 1889, that his works were among the most innovative of the century. When Edison formally met with Gustave Eiffel in the latter's studio atop the Tower, people of France and the United States rejoiced to see the geniuses of the two sister republics together at the pinnacle of the Exposition Tricolorée. The American presence at the 1889 exposition was not limited to mechanical or electrical inventions, or to the new (even if half-Parisian) competence in the fine arts. There were other exhibits that seemed to French critics as the products of a nation not quite grown up. One critic noted with amusement that the same nation that had given the world the telephone, the telegraph, and the phonograph could exhibit, with apparently equal pride, a series of heads of American presidents executed in meerschaum. As he was trying to recover from the idea of Americans smoking Jefferson or Lincoln, Arny spotted a gigantic pipe in the shape of a buffalo head, "whose stem was notched, checkered and betoothed like a Gothic spire. It was very well-executed; but only Gargantua could have smoked it." The pipe, he learned had been promised to Buffalo Bill, who had hitched his horse to the Eiffel Tower as he toured the exposition. Chocolate sculptures alongside the phonograph, Buffalo Bill's buffalo head pipe by the Singer sewing machines – no wonder that European intellectuals had such difficulty in assessing American culture. We have already seen the stinging reference to American business culture in the attack by the Committee of 300 – "Even the commercial Americans would not want the Eiffel Tower" – implying that taste in the United States leaves a great deal to be desired, even if it not so depraved as to lust after the colossally ugly. In fact, the United States occupies something of a special place in the esteem of French journalists and intellectuals in 1889. Americans are regarded as a kind of third estate, somewhere halfway between the countries one must take seriously – England, Italy, and other European nations – and the colonies, which one values precisely insofar as they accept European civilization and supply European nations with either raw material and/or interesting examples of native culture. Not until the 1900 exposition will the United States demand – and receive – its place as an equal to the nations of Europe. The Exposition Tricolorée was more than just another excuse for Paris to play host to the world. More than any other event in the recent history of France, the 1889 fair gave the nation a chance to think over and to assess its own past. In the 100 years since the Revolution, France had been the stage for some of the most destructive and most creative acts in the history of the human race. Now, in 1889, the destruction seemed to be over. Peace and prosperity had reigned for almost two decades. The Revolution was bearing its finest fruits at last. Only in one instance did an outsider – one scorned by the French institution of academic artists and critics – succeed in placing a work in the French fine arts exhibit. Several years before, Auguste Rodin had been accused of cheating by using a life cast to execute his Age of Bronze. Rodin was cleared by Edmond Turquet, deputy Minister of Fine Arts under Antonin Proust. The charge was leveled once again at St. John the Baptist. This time the government not only vindicated Rodin: in clear defiance of the Academie des Beaux Arts, it exhibited this work among the masterpieces of French sculpture at the exposition. Rodin himself served as a juror for the exposition. Even in the conservative fine arts, revolution was winning out. Why was this innovative building destroyed? Because, according to its enemies, the Palace of Machines spoiled the view of Les Invalides, one of the masterpieces of ancien régime architecture, whose lordly dome rises up over Napoleon's Tomb. The vast interior of the Gallery of Machines was impressive from an engineer's point of view. But the building's exterior lacked sufficient traditional elegance to save it from destruction. Its only purpose would have been to house temporary exhibits – and this function, in 1910, belonged to the Grand Palais. So the Gallery of Machines went the way of so many other near-masterpieces of exposition architecture in Paris. 3 To be fair, we should note that the commissioners had not planned on preserving the tower. As we shall see, the most famous of all world's fair buildings won immortality only through the adroit maneuvering of its creator. It would not be until the 1900 exposition universelle that the exposition commissioners consciously set out to create buildings that would outlive the fair itself and become permanent monuments of the city. 12 Henri Loyrette, in his admirable study of the tower Gustave Eiffel, (New York, 1985), draws a fascinating and convincing parallel between Garnier's disparagement of iron with Charles Baudelaire's earlier (1859) disdainful treatment of photography. 16 The Franco-Egyptian commissioners clearly reckoned both Cairo Street and the belly dance a success. Both features of the Egyptian exhibit would be exported in 1893 to Chicago and in 1894 to San Francisco. Along with the military exhibits, the colonial section presents in striking fashion one of the two complementary faces of the French government and nation. In effect, republican France, such as it was from this time down to 1914, presents a double character. On the one hand, France is, and desires to be, the educator, the benefactor, the dispensor, to all people young and old, of intellectual and material nourishment, distributor of enlightenment and bread. It is in this profoundly-felt feeling that we encounter, in the expositions of 1889 and 1900, the sections devoted to public instruction and social economy. But on the other hand, France states clearly that she will not renounce her mission of world-wide imperialism. This mission, its clear statement and its sense of justification, can be found in the exhibits of the colonies and the military, both on the Esplanade des Invalides. 26 See Jean-Luc Daval, "Gauguin and the 1889 World's Fair," in Modern Art, The Decisive Years, 1884-1914 (New York, 1979), pp. 64-65. Gauguin and his friends named themselves the "Impressionist and Synthetist Group," and opened their show at the Café Volponi in May of 1889. 30 In L'Exposition de Paris, June 8, 1889, page 115 ff. Allwood, John. The Great Exhibitions (London, 1977). Bouin, Philippe and Chanut, Christian-Philippe. Histoire Française des Foires et des Expositions Universelles (Paris, 1980). Daubin, Maurice. "Le palais des macines à l'Exposition Universelle," Journal de la Jeunesse, 1889, Volume 2. Eiffel, Gustave. La Tour Eiffel vers 1900 (Paris, 1902). L'Exposition de Paris (1889), Publiée avec la collaboration d'écrivans spéciaux, bound as two volumes (Paris, 1889). Garnier, Charles. "Le diner de l'Ecole," L'Architecture, December 17, 1892. Henard, Eugène. "L'Architecture en fer à l'Exposition de 1889," Le Génie Civil, July 6, 1889. Huard, Lucien. Livre d'Or de l'Exposition (Paris, 1889). Isay, Raymond. Panorama des Expositions Universelles (Paris, 1937). Lenotre, G. L'Exposition de Paris 1889, two volumes (Paris, 1889). Loyrette, Henri. Gustave Eiffel, (New York, 1985). Mantz, Paul. "Exposition Universelle de 1889: La Peinture Française," La Gazette des Beaux Arts, July 1, 1889. Monod, E. L'Exposition Universelle de 1889: Grand Ouvrage Illustré, two volumes (Paris, 1890). Picard, Alfred. Exposition Universelle Internationale de 1889 à Paris. Rapport par M. Alfred Picard (Paris, 1891-96). Poncetton, F. Gustave Eiffel (Paris, 1939). Vogué, Melchior de. Remarques sur l'Exposition (Paris, 1889). Wilson, E.B., general editor. The Executive Documents of the House of Representatives for the First Session of the Fifty-First Congress, 1889-1890, Vol, 38 (Washington, D.C., 1893).